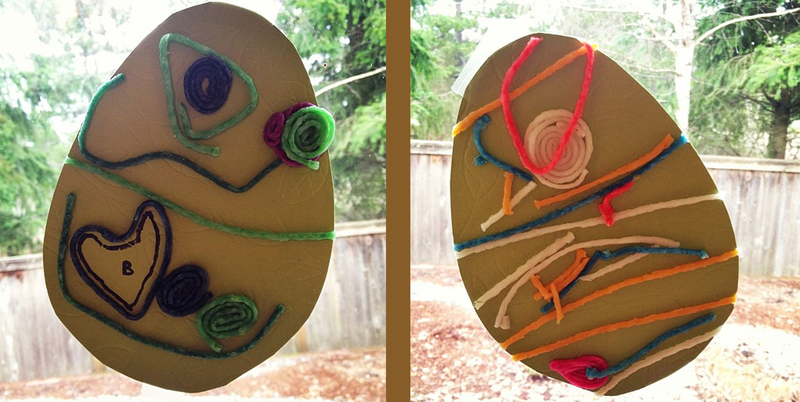 Last week we talked about lines (at home): what they are, how they can make shapes… and then decided to use the idea on the Easter eggs we want to put on our windows. We took wikki stix (that we haven’t played with in a long time) and started decorating. My 5-year-old tried to make hearts and spirals, which was really cute… while my 2-year old went for quantity (and just stole on of the shapes from her brother when he wasn’t looking). Anyway, I really liked this because it was fun, fast and totally mess-free. No glue, no leftovers… just two eggs for our window display. This entry was posted in Art Projects and tagged art, ArTree, easter, egg, project, stix, wikki. Bookmark the permalink.